Skin tags are small, benign growths of skin connected to the skin surface by a thin stalk of tissue. Also called an acrochordon, cutaneous papilloma, or cutaneous tag, they typically occur in areas where clothing or skin-to-skin friction causes some irritation. This can happen in the underarms, neck, groin, eyelids, and upper chest and their frequency can increase with age due to skin sensitivity. There can be a genetic predisposition, causing them to run in families and usually occur in about 25% of adults. What causes skin tags? How can skin tags be treated? Let's find out the answers to these frequent asked questions. Many researches have been done to determine what causes skin tags, though not much has come of them. Skin tags are composed of nerve cells, fat cells, ducts and fibers, and the skin. They are generally like non-cancerous tumors on the skin. Chafing of skin. Constant and repetitive friction against the skin can cause skin tags. This can happen from clothing but is more often caused by skin-to-skin friction. Obese people are more likely to have skin tags because the folds of skin are constantly rubbing, causing chafing and then thickening of the skin. 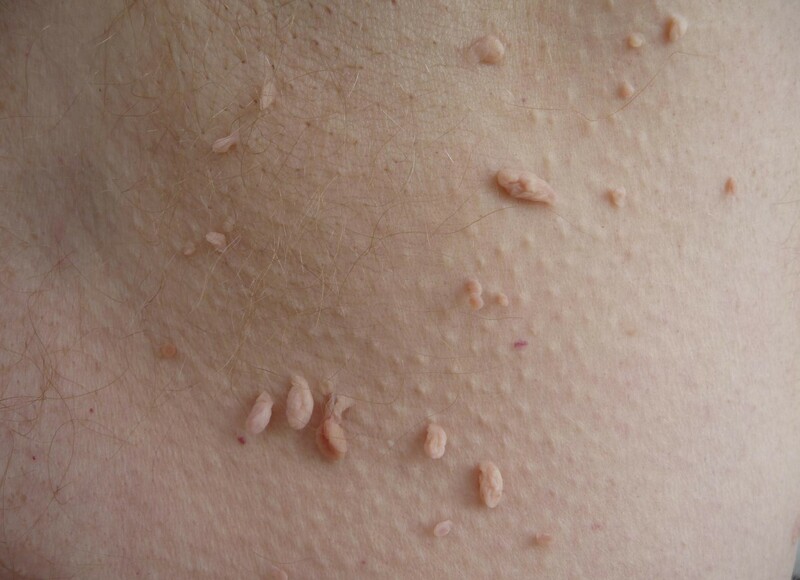 This is also why skin tags develop in areas such as the underarm and groin. Hormone imbalance. Skin tags are common in pregnant women due to the imbalance of hormones. Skin tags are also seen in women with polycystic ovary syndrome, which is a hormonal disorder. Skin tags are also common in people with other hormonal disorders such as gigantism, which is caused by higher levels of growth hormone. HPV infection. Through research of the causes of skin tags, scientists have found the DNA of two types of human papilloma virus in about half of the skin tags studied. So the HPV virus, of which there are about one hundred types, may cause skin tags in some people. Diabetes and metabolism. Skin tags have been commonly seen in people with type 2 diabetes and metabolic syndrome, which is a group of ailments that include high blood pressure, abdominal obesity, high cholesterol, and insulin resistance. Abuse of steroids. Illegal steroids can cause skin tags by causing collagen fibers in the skin to bond to each other, forming the small growths. This is the result of the steroids interfering with the natural workings of body and muscles. Family history. Genetics can play a role in the development of skin tags. If you have relatives with skin tags, chances are you will develop them at some point in your lifetime. Where Do Skin Tags Grow? Since we have known what causes skin tags, it's time for use to find out how to deal with them. There are a number of treatments for skin tags, if they bother you. Home remedies work quite well. If you wish to get rid of tags for cosmetic reasons or because they are in an area prone to friction and irritation, you can consult with your doctor about medical treatments. Try clear nail polish. It is believed that applying clear nail polish to the skin tag causes it to dry out and eventually fall off. To do this, apply a thin layer of nail polish to the tag and let it dry. Repeat this process two to three times a day until the skin tag falls off. You can wiggle the skin tag to speed up the process. Apply lemon juice. The acid in lemon juice can dry out the skin, thus drying out the skin tag and helping it fall off. You can rub a slice of lemon right onto your skin, or dip a cotton swab into lemon juice and apply it to the tag. Apply every day until the skin tag falls off. Apply tea tree oil. Tea tree oil is known for its treatment of a variety of skin conditions, such as acne, and it also can eliminate skin tags. Soak a cotton ball in water to dilute the oil, and then add a few drops of the tea tree oil to the cotton. Dab it onto the skin tag one to two times a day until the tag falls off. Use ligation. Ligation is a painless and bloodless procedure that involves the use of string or dental floss to tie off the skin tag, cutting off its nutrition. Tie the string around the skin tag and tighten so that the blood supply is cut off. Leave it for a few days, tightening if necessary and the tag will dry out and fall off. The skin underneath will have already healed. If home remedies fail to do the trick or if your skin tags become a problem, you can always turn to medical treatments to have them removed. Remove with surgery. Removal of a skin tag by your doctor is quick and easy, and is done right in the doctor’s office. The size of the tag will determine if the use of an anesthetic cream is necessary, and the removal is done with either a scalpel or surgical scissors. There may be some bleeding, but the area will heal within a day or two. Cauterize skin tags. Your doctor can use cauterization to remove the skin tag very easily. An electric current is used to kill the tissue, causing it to fall off. The procedure is painless and there is virtually no bleeding. You may have to pay for this procedure yourself, as most insurance companies consider it cosmetic. Freeze off skin tags. Your doctor can perform cryotherapy which freezes skin tags with liquid nitrogen, causing them to die and fall off. This is a painless procedure that is done right in the doctor’s office. Cryotherapy may cause some temporary skin discoloration, which will fade over time.